Dr. Molano and all of the staff at Aurora Dental Clinic are just superb. At Aurora Dental Clinic, we are dedicated to providing professional, high-quality dental care in a nice, friendly environment. We have many combined years of education and experience. We keep up with the most cutting edge technologies and practices to ensure our patients are receiving the best possible dental care. 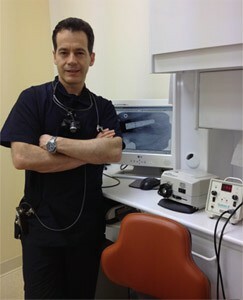 Dr. Ricardo Molano has been practicing dentistry for over 25 years. He has been involved in many activities within the community of Fort McMurray and in his home country with humanity social services. He is always on the lookout for new continuing education courses and has been taking advanced dental education for many years in Orthodontics, Dental Implants, Cosmetic Dentistry, and Root Canal Therapy. Dr. Molano and his wife Gloria have 2 children and they enjoy traveling together. In his free time he likes to read, play tennis and soccer, watch movies, and spend time with his family. He is a member of the Canadian Dental Association and Alberta Dental Association. We have a skilled team of assistants and hygienists waiting to serve you. These trained professionals are qualified to bring you the best in dental care. They will ensure you have a great visit. Our friendly office staff is ready to assist you in any way possible. These organized, efficient and friendly people will help make your visit to the dentist as pleasant as possible.